For most people, the phrase ‘couture nursery’ would be no more than an odd juxtaposition of words. However, for Shabnam and Nanaki Singh of Project Co., the phrase was a key concept in their design for Gazal Gupta’s new bridal wear boutique. Uncharacteristically green, the showroom is a refreshing digression from the elaborate opulence that we’ve come to associate with such spaces. Design Pataki speaks to Nanaki Singh about what prompted the uniquely lush theme of the showroom. The showroom was designed around two trees which Gazal, Shabnam and Nanaki were bent on preserving. 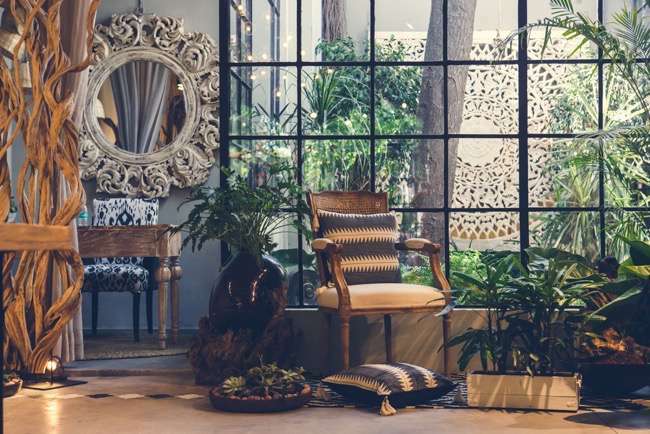 “We like to use the term ‘eco-chic’ as a fitting description of the interiors of the showroom as it has been our constant endeavour to ensure that the greenery is a natural extension of the interior and exterior spaces.”, says Nanaki. 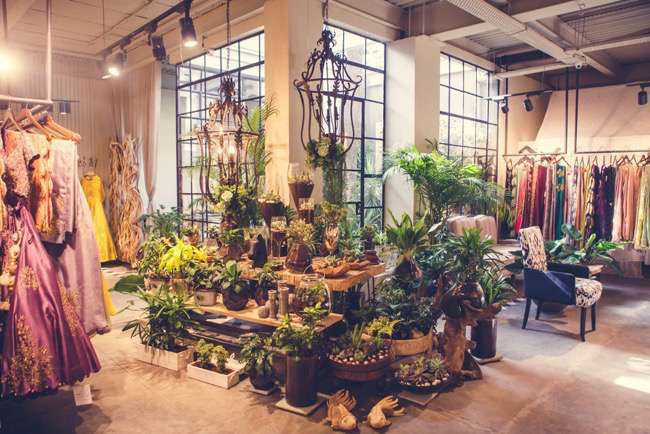 The space is heavily accessorized with assorted plants and planters – all of which are for sale. They have been supplied by Project Plant an offshoot of Project Co. headed by Nanaki. “We wanted to firstly create a beautiful product that would be ideal for the niche clientele that frequents her boutique,” she says. 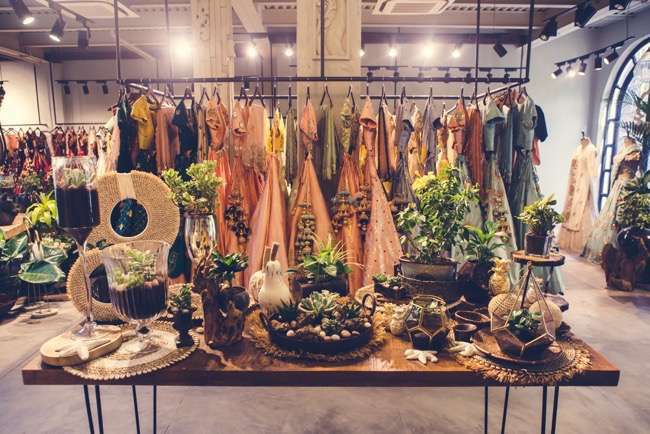 The store has a restored vibe to it, exposed ceilings, old mirrors, simple concrete flooring and a widespread use of recycled wood which form an unusual backdrop to the intricate embroidery and vibrant colours of Gazal’s garments. The designers were wholly committed to the idea of sustainability. “We were conscious about the ‘eco-chic’ part of our design and attempted to refurbish a lot of the furniture and accessories that Gazal had in her previous store, adding our own creativity to this. 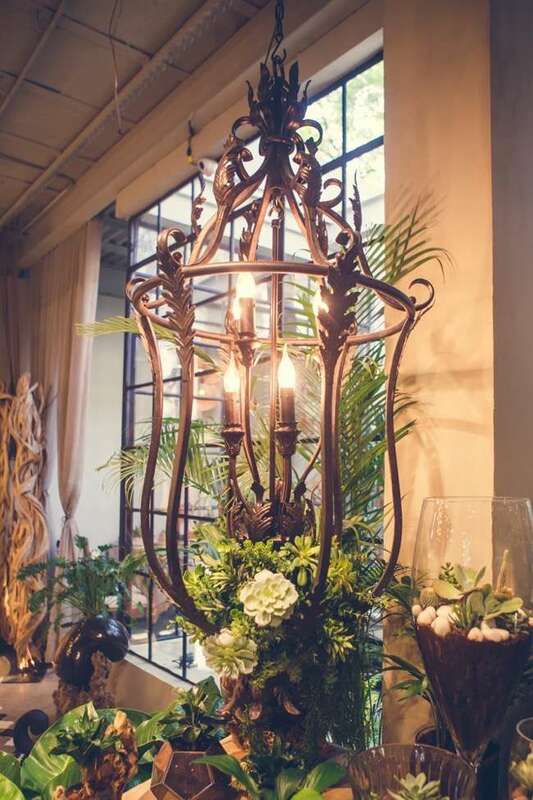 For instance, the huge boat that lies in the courtyard used to be a light feature/element in Gazal’s previous boutique- we decided to re-purpose it as a beautiful, unique planter.” They also went as far as to reuse some of the mirrors from her old boutique. One of the more unique elements of the showroom is the open courtyard built around the trees. 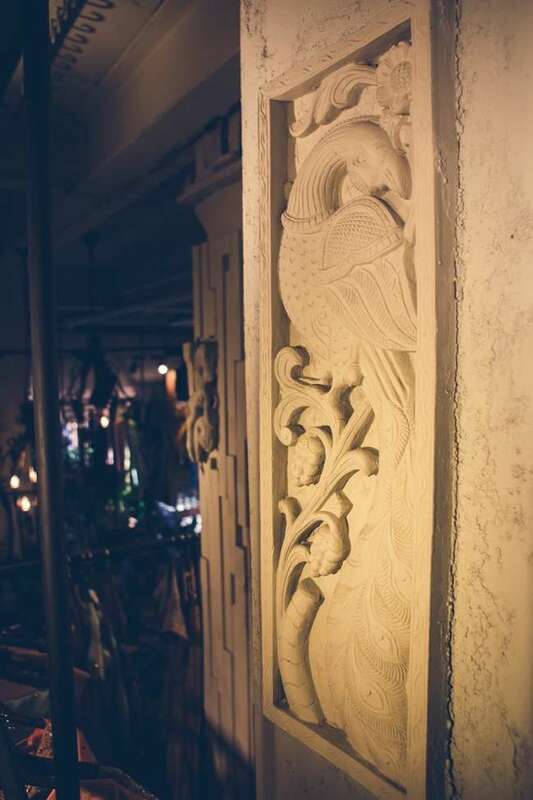 “The courtyard is undoubtedly my favourite corner of the boutique,” says Nanaki. 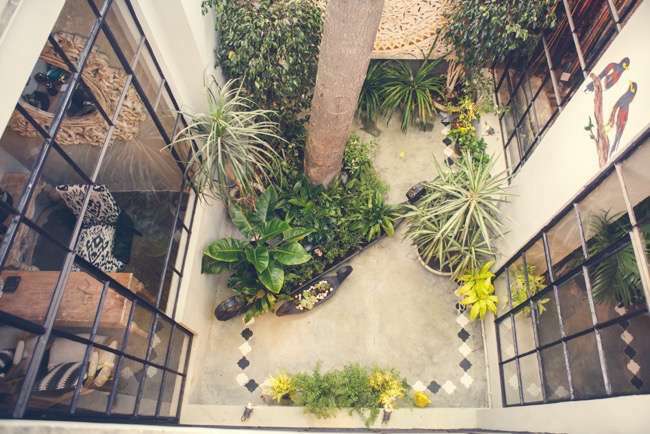 “Within all the chaos of the city and the road outside it provides a lush green respite and adds depth and character to the showroom.” Apart from making for a lovely view, the courtyard allows tons of natural light to flood through the space. With their keen sense of attention to detail, the designers have managed to hit the sweet spot between eclectic and chic – proving that you don’t have to fully commit to either one aesthetic. The distressed wooden furniture, exposed ceiling and bare concrete walls are well balanced by more refined, delicate elements like the engraved peacock motifs on the pillars, the carved backlit jaali in the courtyard and the ornate brass lights. “As a designer herself, it was easy for us to synergize our aesthetics as Gazal had a clear idea about the things she liked,” Nanki concludes.